Where do I begin? It's been an eventful first 2 weeks in our household. Baby M is 12 days old and doing wonderful. With everything going on, we almost forgot today is our anniversary. We had tears in our eyes when the "bigger" one gave us a card this morning. It's the best and sweetest card we've ever received - although, she needs to learn how to spell the word "funniest" correctly =). I have so much to be thankful for - my family, my 2 beautiful girls and my beloved husband. It's not always sunshine and rainbows but even when it's hard, I know I'll have all the support and love I could ever ask for. Words cannot express how much I love my family. Happy Anniversary to my dear husband. Thank you for being you, for being an amazing man and more importantly, thank you for being totally committed to me, to us and to our girls. I had tears reading it too! It's awesome she remembered! And I agree, times can be rough, but it's great to know you got someone watching your back :). So sweet... such a cute post! Aw, she's so sweet. : ) So cute how she remembered too! Happy anniversary! Congratulations on Baby M and Happy Anniversary. This is such a touching post. At least she drew a peace sign and not a Mercedes logo! I have seen a lot of 7th graders over the years make the mistake and draw the Mercedes logo. Awww. She is a sweetheart. Happy Anniversary! I was so touch about the content of this post. 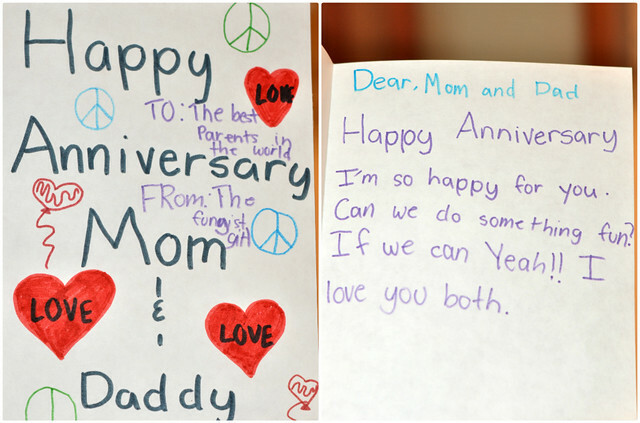 Your daughter is so sweet to make a card writing her emotions. My best regards to your family, life has ups and down but so nice to know you have enough foundation over it.Stay happy! u r right, Sydney.... It's not always sunshine and rainbows. It was our 14th anniversary yesterday as well. Congrat on your baby M & Happy Anniversary! Awwww, that is so sweet of her! Happy anniversary to both of you! You got an amazing card from your kid! Happy Anniversary, Sydney!! Aww, C is so thoughtful and sweet! Happy Anniversary!